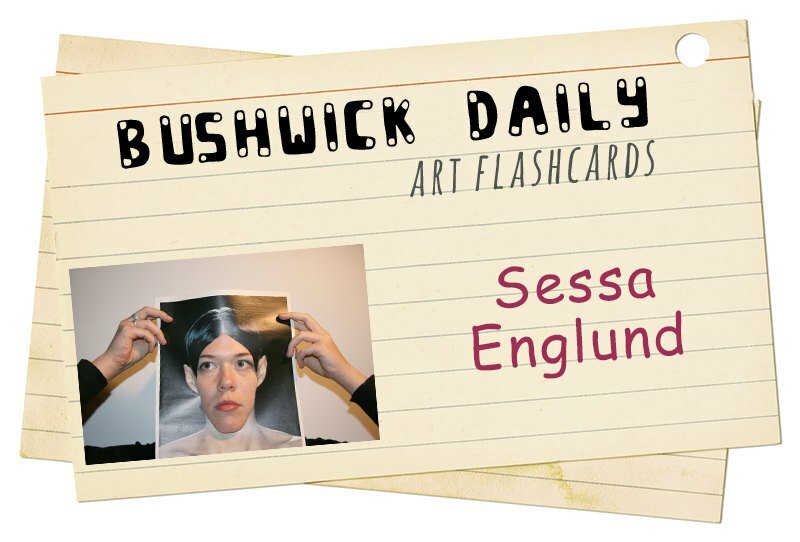 Each week Bushwick Daily brings you a new Artist FlashCard introducing an amazing artist living/working/showing in Bushwick who you need to know. Featuring both new and old faces, our goal is to encourage the growth of art scene and to appreciate wonderful talent in our hood! If you know of an artist you would like to suggest for Artist FlashCards, please fill out our online form. What: Sessa's personal interiors become external as she bravely unveils herself through public commodities. 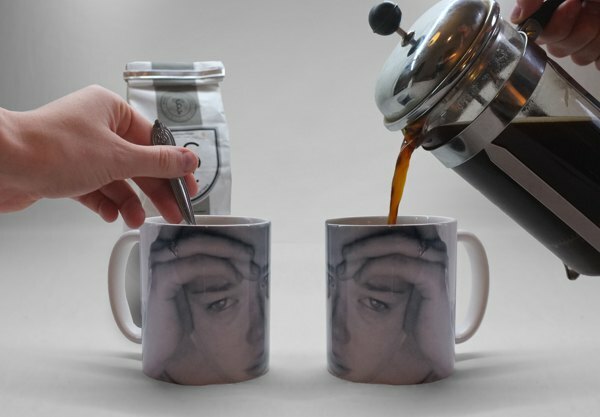 Where you’ve seen her work: You can find Self Placement* – a personal photo series printed on a set of mass-produced coffee mugs on display and for sale at Valentine Gallery. Why we’re into it: We recently caught up with Sessa at February’s Bushwick Art Crit Group while presenting her Self Placement * series and diving deep into the views behind her work. Sessa described the intimate technique of inflicting herself on a medium as a way to legitimately understand it. In Self Placement *, the public space becomes a canvas for her own personal reflection, revealing emotional interiors through familiar products. Sessa is also working with Julia Sinelnikova from Arts in Bushwick to plan three panel talks for this year’s Bushwick Open Studios. These will weigh in on the affect of housing and real-estate development within the neighborhood and offer an open discussion on the role of art and creativity in our society as framed through the mindset of the Bushwick artist community. Having recently curated Introductions, a group exhibition by the Japanese art collective Art Beasties at Brooklyn Fireproof East, as well as various shows for The Con Artist Collective, Sessa, has been active in both the creation of her own art and furthering the exposure of others. 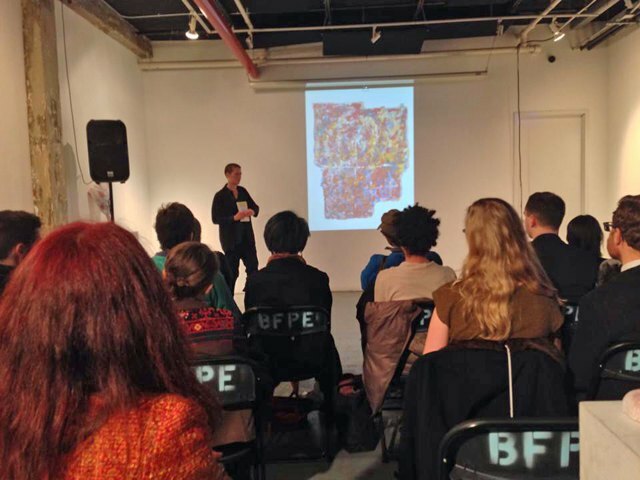 Sessa Englund presenting at the February Bushwick Art Crit Group. When Sessa is not contributing to BOS or curating shows, she is exploring new ways to take private experiences and put them in a public space. Very fitting of her role in the art world, one of Sessa’s upcoming projects is a show that will examine artists who curate, slated to open in the Spring. In maintaining the critical balance between curator and artist, Sessa will collaborate with Brooklyn-based artists Lucia Love, Benjamin Bertocci and Jen Hitchings, who are essentially all doing the same in tandem.